In the early 90’s, the Walt Disney Studios attempted to make a return to bringing family films to the live-action realm. There had often been remembrances of classics like 20,000 Leagues Under the Sea and Marry Poppins, but years had passed since those films were made. In 1991, the studio adapted Jack London’s book White Fang for the screen. While it was a modest hit for the studio, 1992 would not be so lucky. For that was the year when Newsies hit the big-screen. Touted as the studio’s first live-action musical since Mary Poppins, and featuring music by composer Alan Menken (fresh off his Academy Award wins for Beauty and the Beast), the world apparently wasn’t ready for a rag-tag group of newsboys dancing around New York City. Since then, the film has become one of company’s titles that gained a small cult-following. Those who were into musicals found out about it years afterwards, and some would even use the music pieces for recitals or demo reels. When Director Kenny Ortega was doing choreography for one of the Olympic games, he was surprised at the amount of demo reels he saw, that had people performing to Newsies’ music. Of course, along with it’s fandom, and a revival into an off-Broadway sensation 20 years after its release, there is also…the Dark Side, of Newsies. Young men performing on a film are bound to get into mischief. But give them a camcorder, and plenty of time on a movie studio backlot, and their minds will surely come up with something bizarre (sorry girls, I know what you’re thinking, and your fanfiction fantasies have not come true). Filmmaking mischief was what happened during the filming of Newsies, and the result was Blood Drips on Newsies Square. Conceived of by several members of the film’s cast (Michael Goorjian, Trey Parker*, Max Casella, & Ivan Dudynsky), the story concerns Don Knotts (portrayed by actor Mark David, with a hugely-extended underbite), who decides that he would be perfect to be cast in the production of Newsies. Yes, that’s right: Don Knotts goes on a killing spree! Admit it, doesn’t that sound funny? Well, the guys have Don use several different methods to take down his victims. One that’s rather entertaining, is where he tricks Max Casella to climb to the top of a tall set to retrieve his chair. Don then gives Max a little shove, leaving him dangling over the edge. Needless to say, Don uses a method that cartoon afficianados will surely recognize. There’s also a small cameo by Lucy Boryer, who at the time, was appearing on Doogie Howser, MD (along with Max Casella). Being on the Universal Studios backlot, the filmmakers took full advantage of their surroundings. From the main set, to the movie trailers, and up in a hilly area away from the street sets. They’re almost always in their on-screen wardrobe, but do some fun little character/costume setups. A fine example of this is when Don Knotts enlists the services of Fire Marshall Brett (backup dancer Brett Dieball, doing a great impersonation of Jim Carrey’s Fire Marshall Bill persona from In Living Color), to help him eliminate the Newsies cast in a faster way. This almost feels like one of those wrap-party videos, and one has to wonder if it was shown at the conclusion of filming, or if they finished it sometime afterwards. If this little work sounds intriguing, Michael Goorjian has a website where you can buy a copy. It’s available on DVD and VHS, for $25 (plus s&h). The picture and audio quality isn’t perfect, but what do you expect from something shot on videotape? Not exactly Oscar-worthy, but it’s cut together competently, and entertaining enough that it gives me a good laugh when I need one. Prior to the year 2000, the original trilogy figures from Star Wars were grouped into the Power of the Force 2 label (on green-tinted cards with Darth Vader’s mask), and the Episode I label (on red-tinted cards with Darth Maul’s face). Starting in late 2000, Kenner joined both the Original Trilogy and Prequel lines into the Power of the Jedi line. The release came out 2 years prior to Attack of the Clones, and had some interesting figure choices. We got a couple more costume shots of Padme Amidala and her decoy, and a couple figures based on art concepts of the series’ Expanded Universe. Even so, I thought I’d give my Top 5 favorites from this series. I know that this is supposed to be a Top 5 list, but I decided to add an honorable mention to the mix. Originally, the Mother of the Dark Lord of the Sith was meant to be number 5 on my list, much like Aunt Beru in the Power of the Force 2 line. 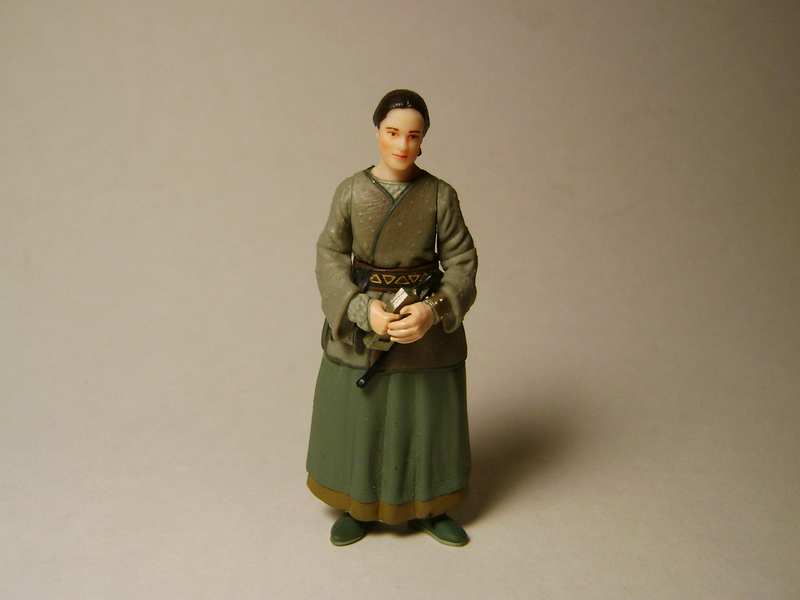 There’s some nice clothing detail work on Shmi, and her little adding machine is a nice accessory. I had wanted to give her the 5th place spot, but there’s one major issue that kept me from doing so: the paint applications and light color of her skin. Pictures of Shmi in the film show her with a darker skin tone, the kind one would find on such a warm and unforgiving planet as Tattooine. Also, the rouge on her cheeks and the simplicity of her eye-painting just makes me crinkle my brow. Even so, I can’t fault Kenner for providing us with another link in the Skywalker family. I know what you’re thinking: “who is Ketwol! ?” Well, up until 1997, he didn’t exist in the Star Wars universe. When Lucas decided to fix some pet peeves in A New Hope, one of those was to evict resident “wolfman” Lak Sivrak from the cantina scenes. In his place, came Ketwol. However, that’s not the whole story. Ketwol’s name also has a fun little meaning to it. You see, his head can be turned backwards, and create a whole new character. Both of Ketwol’s faces appear in the cantina, and most likely as an inside joke regarding this, just spell and say his name backwards. There’s also a surprise under his pants (no, not that!). You see, Ketwol isn’t exactly human-height, but has stubby legs, and wears metal extensions. This is probably one of the first Star Wars figures you can (officially) display pantsless. Probably out of all the different characters introduced in the Special Edition re-releases, Ketwol definitely gets more kudos from me for the added character creativity. Of the various computer-generated characters in The Phantom Menace, one of my favorites is Sebulba. I attended a special presentation regarding the Star Wars: The Magic of Myth exhibition at Chicago’s Field Museum in December of 2000, and several of the guys from Industrial Light & Magic were there. One of them, was animation supervisor, Rob Coleman. Rob even mentioned that Sebulba had a bit of a fan-following (even at ILM), and showed us test footage that I still can’t forget. 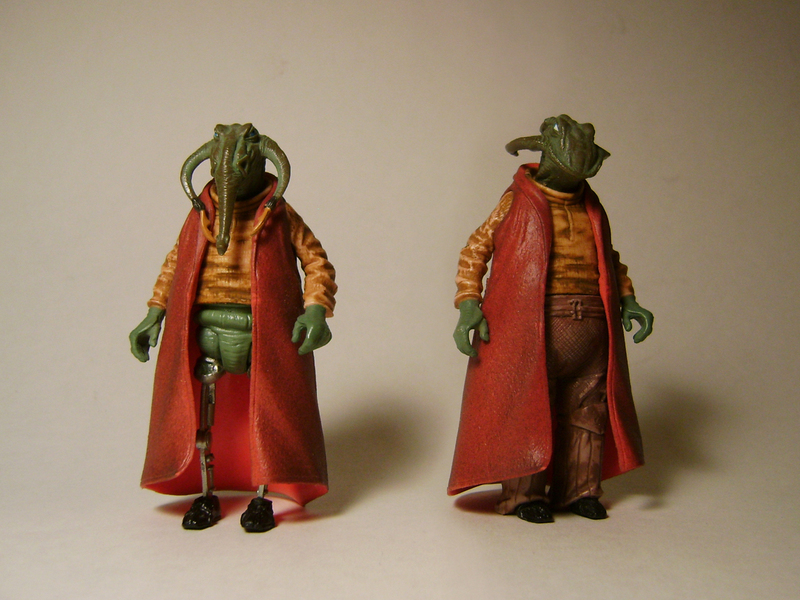 Prior to this figure, Sebulba had appeared in two figure forms: in his street gear as part of the Mos Espa Encounter 3-pack with a figure of Jar Jar Binks and Anakin, and in his racing gear as a pack-in figure with his mammoth orange and black podracer. With the Boonta Eve figure here, Kenner chose to combine traits from both of these figures. Unlike the podracer Sebulba, this one has a removable helmet, and the facial expression is a new sculpt, reminiscent of his giving Anakin a sinister grin. 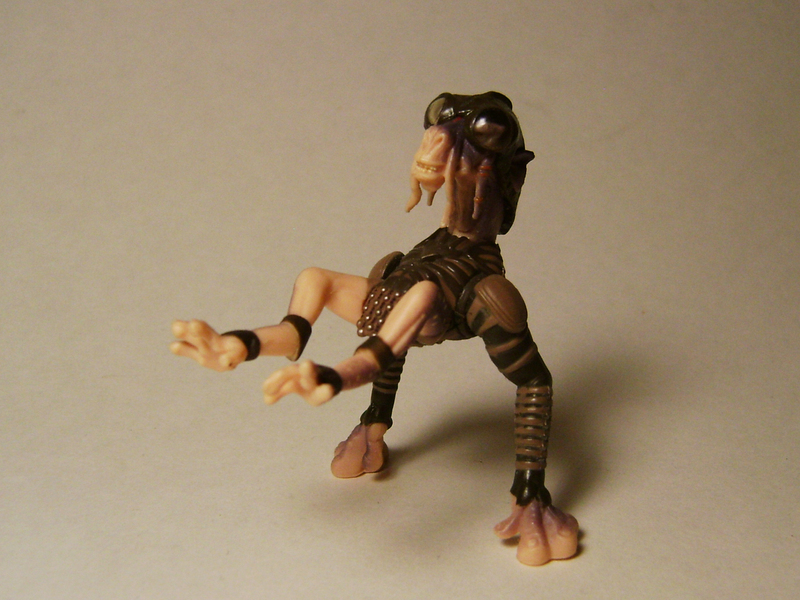 This figure is a much ‘cleaner and more detailed’ version of a very interesting-if-brief character in The Phantom Menace, though one has to wonder what a more updated version of Sebulba would look like, with increased articulation in his limbs. Porkins is one of those figures that only comes with a removable helmet, but then again, he’s mainly meant to be in the cockpit of an X-Wing. The paint applications are pretty good, and he’s also one of the first figures to have an unshaven look to his face. One thing some may have trouble with, is getting him to actually FIT into an X-Wing. This is one of those figures that seems to have been instrumental in paving the way for other pilots in the Death Star battle. 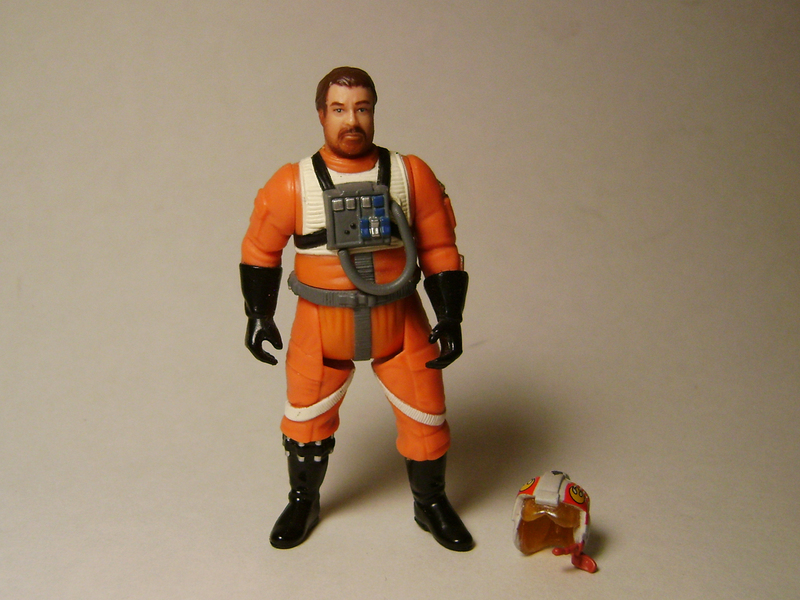 Prior to Porkins, we had pilot figures of Luke, Wedge Antilles, and Biggs Darklighter. Soon after, we’d get many, many, many more. I guess it’s the little boy in me: I’m rather excited when it comes to characters that have pieces that come off. In this case, it’s literally a character sliced in half! Many were pretty much incensed when it seemed Lucas had killed off what some were hoping was going to be the Darth Vader of Episodes I-III. 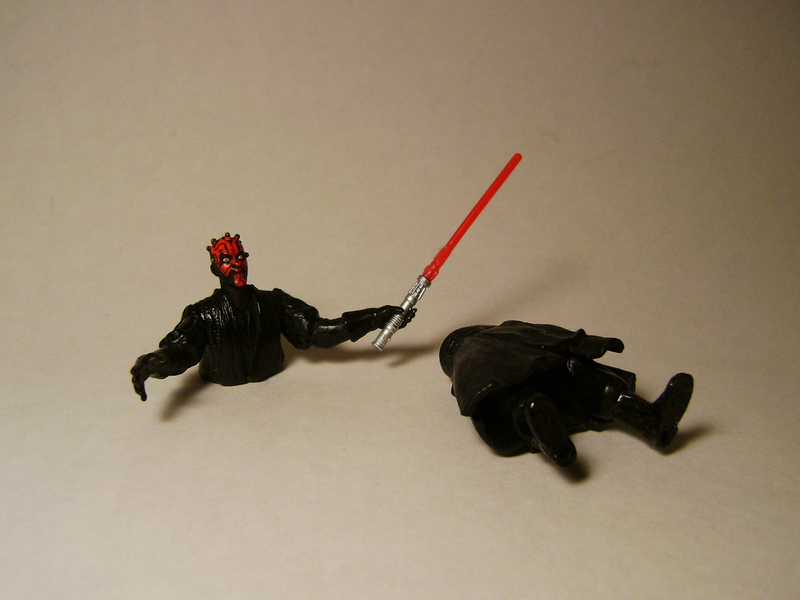 This figure was rather ingenious, as Kenner could have used plastic tabs to pop apart Maul’s body. Instead, they used magnets, which makes him easy to separate, and put back together. The look of shock on his face, the spread-arms pose, just eagerly ask you to put him on a table high off the ground, and push him over, to watch him break apart as he falls or hits the ground. Much like Darth Vader with Removable Helmet (my Number one favorite Power of the Force 2 figure), this is probably the second iteration of Vader that sticks in people’s minds. 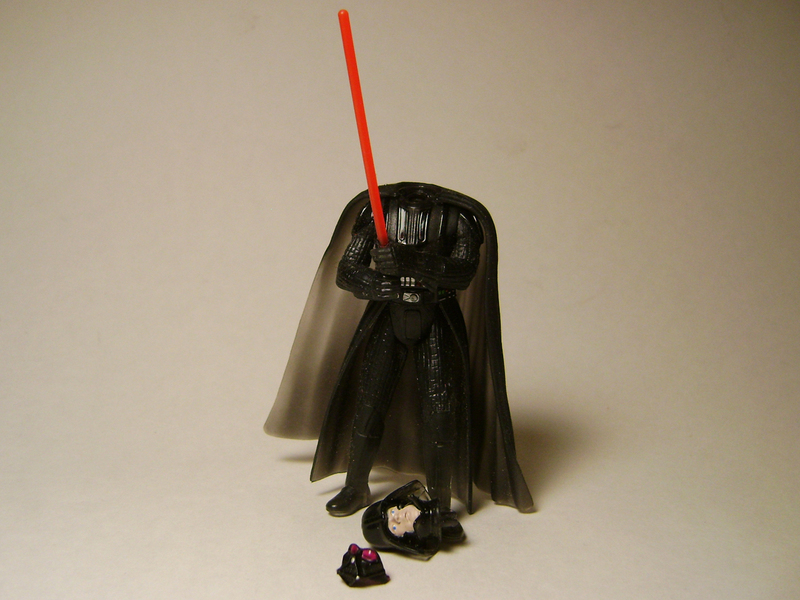 I remember a comic shop in Cedar Falls, Iowa, that had an older version of Vader missing his head, and a joke sticker saying that the $500-priced figure was a rare Vader based on the scene where Luke ‘lops’ the Sith Lord’s head off. Of course, this version of Vader isn’t truly real, but a spirit that takes his form, and whom Luke confronts in a cave on Dagobah. Some of the best detail is in the plastic, which has some translucency to give it a ghostly quality. However, the big surprise is the head, which is attached by a couple plastic tabs (be careful, if one breaks, the head will not stay in place). Not only can you decapitate Vader, but you can also remove a piece of the faceplate, showing Luke’s face inside, and giving Luke himself a shocking revelation! And so, another year, another top 5 figures list. Looking over the various figures from this line, there were some that were quite fun and creative. Kenner also started the Fan’s Choice figure creation during this line, where the fans would get a chance to vote on a figure they’d like to see produced. This practice is still going strong even today. Power of the Jedi was probably the last action figure line I was really excited about collecting. I’ve never been able to explain it, but once the Attack of the Clones figures came out, I really pulled back from collecting for a couple years, with the only real ‘blip’ being the Original Vintage Trilogy Collection that was released in 2004 (with super-articulated figures from the first trilogy, packaged on original card reproductions). There’s still plenty I could cover regarding Star Wars toys (I have a certain Disney-related playset that I’ve been meaning to post a review of), though this may be one of the last Top 5 lists for awhile. Of course, I have plenty of other toys and figures to review/critique/compare/criticize, so we’ll see what the rest of 2013 holds for Action Figure Analysis. DVD Set Review: Tiny Toon Adventures – Crazy Crew Rescues! It’s funny what can happen sometimes. In my episode review of Buster and Babs Go Hawaiian, I lamented Warner Brothers’ last releasing a boxset of Tiny Toon Adventures way back in 2009. As if some cosmic force heard my thoughts, we now have the release of Tiny Toon Adventures – Crazy Crew Rescues! It sounds like some kind of made-for-tv movie, but this is the series’ Season 2 release many of us have been waiting for! The set also includes four episodes from Season 3 of the series. This could be to balance out the eventual Volume 4 release, so that both of these volumes have (almost) the same number of episodes. As to when (and if) we’ll get Volume 4, it’s too soon to say. It’s amazing how the animated series churned out over 65 episodes(!) in its first season, and then followed up its second season with only 13. Maybe the break-neck pace of the first season killed off most of the staff. Buster and Babs Go Hawaiian – One of my all-time favorites, as mentioned in one of my previous Retro Recaps. Notable for being the only time in the series where Steven Spielberg voices himself! Kon Ducki – Plucky Duck’s epic film about sailing to Salinas in 21 days, including a making-of special tacked on. 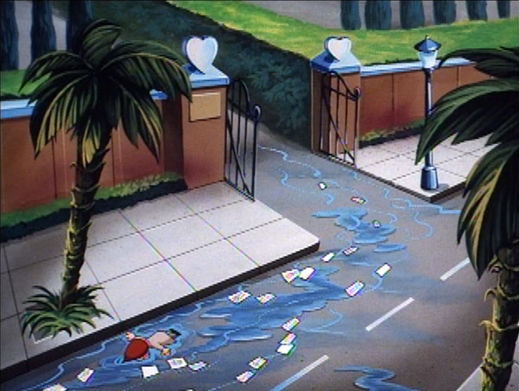 Sepulveda Blvd – a parody of Sunset Boulevard, where Montana Max portrays a plagiarizing cartoon writer, who shacks up with washed-up former cartoon star, Elmyra Desmond. This DVD set also contains two episodes with segments regarding Plucky Duck as a child, that are often remembered by many to this day. One is in regards to him using the toilet (“I wanna flush it again”), and another revolving around a mall elevator (“elelator go down the hole”). If either of the quotes in that last line sound familiar to you, then you surely know one or both of these segments. 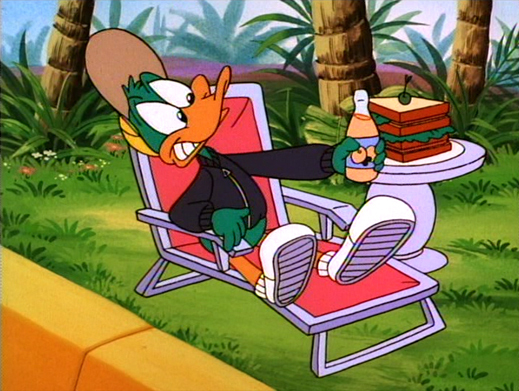 It’s also notable that several of the episodes include background characters that would appear in the direct-to-video special, How I Spent My Summer Vacation. One of the highlights of the set, is the inclusion of an episode that was removed from television syndication due to controversy. In the episode Elephant Issues (a parody of the phrase “relevant issues”), the three segments cover everything from illiteracy, prejudice, and peer pressure. The segment regarding peer pressure, titled One Beer, was what put the episode in jeopardy. In the episode, Buster Bunny, Plucky Duck, and Hampton J Pig, find a bottle of beer in the fridge. Plucky and Hampton soon give in to Buster’s needling, and the three plunge into a television-style ride through the dangers of underage intoxication. “But Buster, this isn’t like you,” says Hampton at one point. Rumor is this episode only aired once, but as is the internet, I can’t find enough sources to make this a concrete fact. Though in a sense, it seems every series has at least one episode that makes people do a double-take. While the release of these episodes is welcome, the quality of the ‘presentation’ of the episodes has taken a steep nosedive. It seems that the objective for this set was simply to get episodes out, with minimal involvement. I know not many people buy these boxsets for stuff like this, but come on, show us a little more care Warner Brothers! The DVD menu and disc art for this set looks like something some of us could do making bootleg Season 3 sets on our own time! Much like the previous DVD release, there are no special features. No interviews with voice talent like Charles Adler or Tress MacNeille, and nothing from the crew who worked on the series. Pretty sad, as even additional DVD releases of Animaniacs and Freakazoid got some extras. In the end, Crazy Crew Rescues wins no points for creativity, but gets the job done in fishing into the well of nostalgia, and bringing some more cartoons into the light. Left: Babs does her impression of Homey the Clown from “In Living Color.” Right: Babs does her version of a 2 Live Crew song, singing “Me So Bunny (Me Hop A Long Time)”. This is a multi-part review of Disney’s California Adventure’s latest addition, related to the PIXAR film, CARS. When it comes to the different areas of a Disney Theme Park, there are four things that one can usually find: theming, rides, shops, and eateries. In the last part of our Cars Land review, we will take a look behind the three places to find food around Radiator Springs. Fillmore’s geodesic home in Radiator Springs housed several drums of organic fuel that he had made himself. Though Fillmore would often tout the benefits of his fuels, the version of his home in Cars Land takes a different turn altogether. There are no special juice or motor oil-looking concoctions. Instead, Fillmore’s is home to more organic human foodstuffs, such as water, fruit, and juices. Of course, it also has some less-organic stuff suchas Coca-Cola products, and bagged snacks like Cheet-O’s and Doritos. During my time in Radiator Springs, I did stop by early one morning for a banana. Keep in mind that even here, healthy food items can be a bit pricey. I ended up walking down Route 66 eating a $3 banana. Of the 5 choices available, I had to try the Cone Queso, and flavored popcorn. When it comes to popcorn, two flavors are available to guests: buttered popcorn, and a random flavor. The random flavors include salt and vinegar, dill pickle, bacon and cheddar, sweet & spicy, and nacho cheese. At the time of my visit, the random flavor was dill pickle. I’ve heard there is a ‘flavor rotation,’ but I do not know the frequency of this. As dill was the same flavor during my 3 days in California Adventure, my assumption is they do a weekly rotation. The dill flavor seemed to be more of a seasoning along with some salt. However, it tasted like they added a bit too much salt, which at times came close to overpowering the dill flavoring. Each food stall also includes a special Cars-themed drink (non-alcoholic, of course). At the stand where I purchased my popcorn, I tried Doc’s Wild Grape Tonic. The drink is a combination of Sprite and Grape Juice (topped with wild berry foam), but for some reason, it complimented the dill-and-salt flavoring of the popcorn really well. I also tried a drink called Red’s Apple Freeze, which consisted of frozen apple juice with toasted marshmallow syrup (topped with passion fruit/mango foam). However, I found the drink to be a bit too sweet for my tastes. Once I’d tried the popcorn, it was onto the Chili Cone Queso. The stand also serves chicken verde in the bread cone, as well as a breakfast cone option for early in the morning. The queso I had was okay, and provided a much-needed energy boost to get me through lunch. there was a nice bit of spice added to the queso, along with some shredded cheese and Fritos chips. The bread cone was okay, and had a consistency that reminded me of a regular dinner roll. Also exclusive to the food stands, is a specially-themed souvenir cone-cup. They are offered in both 16oz and 32oz sizes. Needless to say, I had to get a 32oz one! It’s a fun souvenir, with a rear handle embedded in the cone for easy holding. However, if there’s a nitpick I have, it’s how the cup is sealed. One would assume the top of the cone would be a screw-on top, but it just snaps on and off. This proved to create a ‘sticky’ situation for me, as the Coke I had in my cone seeped out a bit over the course of my time walking-and-sipping. I can only imagine what it must be like for parents who have their kids holding one. If you’re looking for a meal in Cars Land, Flo’s V8 Cafe is the place to go. The diner has menus for breakfast/lunch/dinner, but I found myself just having dinner there. For my big meal, I chose their pork loin with Coca-Cola BBQ sauce, mashed potatoes and gravy, cole slaw, and a garlic chive roll. Even though I’m from Iowa, I haven’t been a very big fan of pork over the years, but I was intrigued by the Coca-Cola BBQ sauce. Needless to say, I was pleasantly surprised. The pork was juicy and not as tough as I was expecting. As well, the Coke added to the sauce gave it an extra tang that I wasn’t expecting. The mashed potatoes were creamy enough, that I probably could have gone through a second helping. For me, cole slaw can sometimes be hit-or-miss. I usually prefer the kind that is sweet and has a little liquid to it, unlike some that are a bit too ‘dry.’ Flo’s cole slaw hit right in the center, sweet and a little creamy, but not dry. For a drink, I decided to try their special Cars-themed beverage, Mater’s Tulsa Tea. It consisted of Gold Peak Sweet Green iced tea, topped with tropical fruit foam. One would assume that the foam might act as a good sweetener, but I wasn’t impressed by the drink as I had been with Doc’s Wild Grape Tonic. Later that evening, I decided to have some dessert at Flo’s. I purchased one of their Pie-O-Rama pies, and a strawberry shake. Much like the Cozy Cone, Flo’s has a souvenir cup for their shakes, that looks like an old-fashioned malt glass. However, I passed when I found out it was plastic and not glass (I’m a stickler for authenticity). The pie I purchased was their ‘signature apple cheddar’ pie, which consisted of an apple pie with shredded cheddar cheese on top. The pie is encased in an “ugly pie crust.” These are inspired by the pie crust recipe from the Midpoint Cafe on Route 66. The apples in the pie were good, but I was a little disheartened by the shredded cheddar. It tasted almost like it had been re-heated, and was a bit chewy. I was expecting soft and melted cheese on my pie. In the end, Cars Land has a little something for everyone when it comes to food. From snacks and treats, to sit-down meals. During my time there, I was glad that there were not a lot of lines or long waits at Flo’s or The Cozy Cone. As we take our leave of my 3-part review, let’s take one last look down the main thoroughfare of Radiator Springs, before saying goodbye (for now).